Of all the desserts I’ve ever tried, I truly can’t think of one that makes me weaker in the knees. Flavour-wise, it just couldn’t be more delicious. If you’re trying to impress your guests (or prove that vegan desserts are just as delicious as the conventional), make this!!! You will blow your guests away. I first fell in love with Banoffee pie at Nutie on a recent trip to Sydney, Australia. 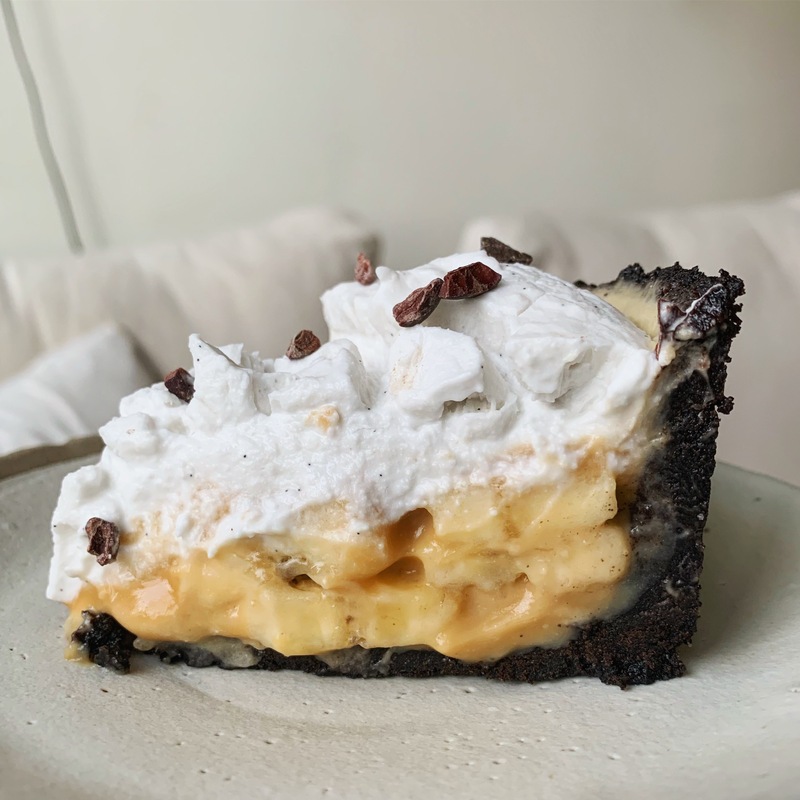 Back home in Vancouver, I got another taste of this banana-toffee creation thanks to one of our amazing To Die For bakers, Andrea, who brought her creation into work one day. I was blown away and asked if she would ever consider sharing her incredible recipe because 1) I wanted it and 2) I knew you guys would love it! She so generously obliged and here it is! Thank you, Andrea!!! 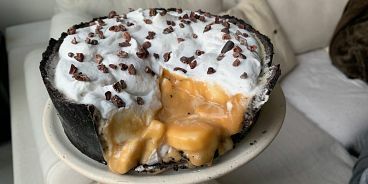 This pie takes a while to make, but is so incredibly easy! No fancy skills required! The hardest part is waiting three hours while the condensed coconut milk cooks. I recommend starting first thing in the morning so it can boil while you do other things / get your day going. Hope you enjoy it as much as do! If you make it, tag us (@erinireland @fleurettevegan) — we’d love to see your creations. Line the bottom of an 8” springform pan with parchment paper (or use a pie plate if preferred) and grease the sides. If using coconut cream for the whip, make sure your cans have been in the fridge chilling for at least five hours (ideally overnight). To make the toffee: Fill a deep bottom pot with water and bring to a boil. Take wrappers off the sweetened condensed milk cans and submerge them in the pot of boiling water. Bring the boiling water to a simmer and continue to fill the pot with water for the next three hours (in the meantime, make the crust). This process will cook the condensed milk until it turns into a thick, golden dulce de leche. After three hours, remove the cans and set aside for about 10 minutes to cool a bit. With oven mitts on, carefully open the cans. A light syrup will have separated from the dulce de leche. Carefully pour this syrup out — make sure you discard the liquid that’s sitting on top of the dulce de leche and the stuff hiding at the bottom (with a spoon, wiggle the firmer stuff to the side to let the liquid underneath escape). Transfer the dulce de leche or ‘toffee’ from the cans to a bowl and whisk to combine until silky smooth. Let cool for 20-30 minutes. To make the crust: Melt vegan butter in a bowl and stir in the Oreo crumbs and a pinch of salt until well combined. Press the mixture firmly into the bottom and up the sides of your pan using the back of a spoon or your hands. Chill the crust in the fridge for at least one hour. To make the coconut whip cream (if you’re not using pre-made whip): Open chilled cans and separate the hardened coconut cream from the liquid. Place the hardened cream in a mixing bowl with vanilla and icing sugar (the pie is very sweet so I prefer the topping to be very lightly sweetened). Whip until fluffy then cover and set aside in fridge. 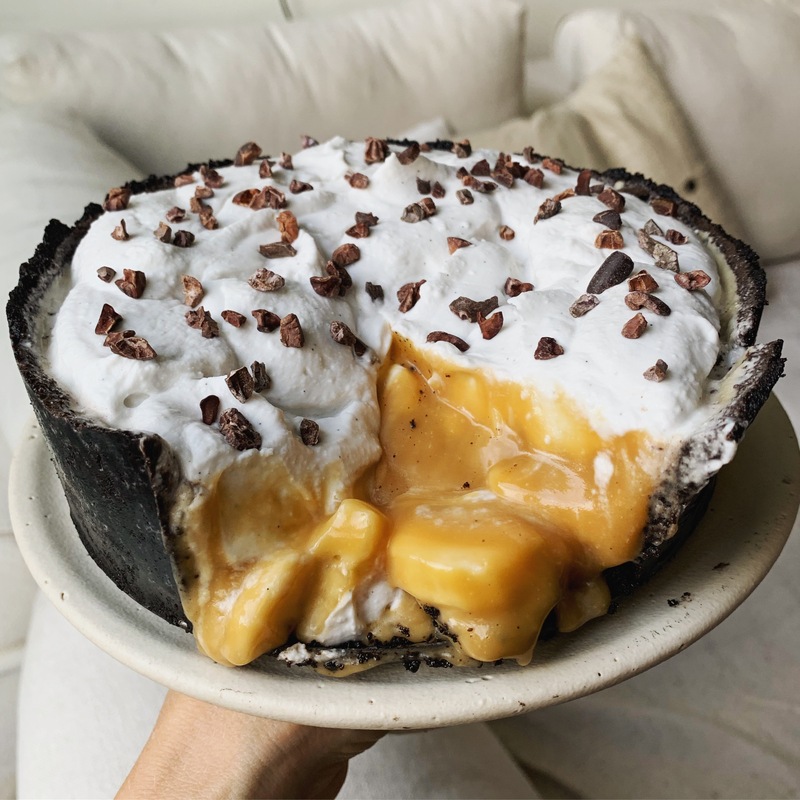 Once crust and toffee are ready to go, slice bananas and place them in and around the bottom of the cold crust then pour the dulce de leche on top of the bananas or pour the filling into the crust and slice the bananas on top of the filling. Andrea prefers bananas on the bottom, but it’s really up to you. Cool and chill again for at least one hour until the caramel is firm (it shouldn’t be as you saw in this picture above! …although this was amazingly delicious!). To serve, remove the tart from the pan and carefully transfer to a serving plate or cake stand. Spoon your whip over the toffee and bananas, sealing the filling in. Sprinkle the top of the pie with cacao nibs and enjoy! *You can find the Let’s Do Organic Condensed Coconut Milk at Vegan Supply, East End Food Coop, Canadian Superstore etc.